The senior White House adviser says she doesn't have any evidence to support Donald Trump's claim that Barack Obama wiretapped Trump Tower. WASHINGTON: Senior White House adviser Kellyanne Conway says she doesn't have any evidence to support President Donald Trump's claim that Barack Obama wiretapped Trump Tower phone lines during the election. Her response was unlikely to tamp down criticism of Trump's tweets earlier this month. The House intelligence committee has asked the administration to provide evidence of the allegation by Monday. "The answer is I don't have any evidence and I'm very happy that the House intelligence committee (is) investigating," Conway told ABC's "Good Morning America." She later tweeted that the administration is "pleased" with the ongoing congressional investigation and "will comment after." Trump's critics have slammed the president for making the explosive wiretapping claim on his Twitter account without evidence. Wiretapping a U.S. citizen would require special permission from a court, and Trump as president would have the ability to declassify that information. James Clapper, who was Obama's director of national intelligence, has said that nothing matching Trump's claims had taken place. Also this month, WikiLeaks released nearly 8,000 documents that purportedly reveal secrets about the CIA's tools for breaking into targeted computers, cellphones and even smart TVs. Conway noted that development to justify Trump's claims. 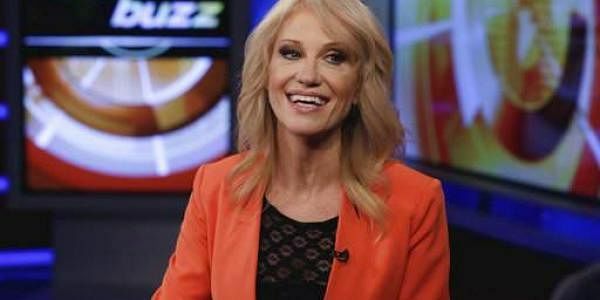 "What I can say is there are many ways to surveil each other now, unfortunately," including "microwaves that turn into cameras, et cetera," Conway told New Jersey's The Record newspaper in an interview Sunday. "So we know that that is just a fact of modern life." Conway told "Good Morning America" that "I wasn't making a suggestion about Trump Tower." She said she was answering a question about surveillance "generally," and without specific reference to the current controversy. FBI director James Comey has privately urged the Justice Department to dispute Trump's claim but has not come forward to do so himself. Sen. John McCain, an influential Republican, said Sunday: "I think the president has one of two choices: either retract or to provide the information that the American people deserve, because, if his predecessor violated the law, President Obama violated the law, we have got a serious issue here, to say the least," the Arizona senator said. The House Intelligence Committee's request for evidence by Monday was made in a letter sent to the Justice Department by the panel's chairman, Rep. Devin Nunes, R-Calif., and its ranking Democrat, Rep. Adam Schiff, D-Calif., according to a congressional official. The aide wasn't authorized to discuss the request by name and requested anonymity.